AWBW has been down and up and now permanently down (? who knows?) for 3 weeks or more and its looking Grim. The previous admin and marriner appear to be just busy with other projects . I emailed marriner last week and offered to help in any way (to cover server costs or whatever or even to take over site management but havent heard back as yet. Jake Ruiz similarly offered to help (mentioned in this fórum), presumably no luck there either so far. The worst thing really is that we have no idea what is going on . So I think we must suppose that nothing much is likely to happen with AWBW coming back. Please anyone with any news about AWBW please post here. Also anyone who knows how to contact marriner please do so and with the backing of myself and many more less vocal but equally keen enthusiasts of AW and the AWBW implementation. I didnt yet try twitter to contact marriner !? Note:The global league had some 80 active players with multiple games (and another 40 or so inactive accounts) plus AWBW had 30 or players in the special leagues plus a number of other random games and many multiplayer maps. So AWBW was definitely still flying though not as high as years back. I encourage all AWBW fans to join with all AW fans and we must now think more widely about AW and the very similar games such as panzer general and others going back before gameboy even. For example I found a website not used much in 3 years called Space Cows which without the cows is basically AW but without certain features like CO powers, fog. Also the units are somewhat difficult to differentiate. This and other similar AW stuff is properly announced elsewhere in this sub Fórum "AW News". So until further AWBW news, I adjourn effort to other threads under AW or online AW. AWBW has been back up a couple of weeks now. But we lost another chunk of players . Possibly including FANG. He probably didnt even know about this forum? Nice to hear someone cares. I wonder if theres a fast way to do that? Let me know if you have any other ideas. A mass message to AWBW users that there's a new forum would be great, yeah. Not sure who would have the power to do that though. I don't mind volunteering to msg everyone on the league individually but do we have a plan after we alert them to the existence of this forum? Blanci and mori, let's start an email chain so we can discuss further in more detail, my email is ctseung@gmail.com . guys, feel free to send a private email and I'll add you to the chain as well. I sent a quick msg to people currently on the league. But it also means those not on the league will not have received it. Mori has created a new awbw forum because the old one has crashed. Please pass this message to your friends. Yeah the end objectives are not totally clear at present. The emails and messages are ok but there are many reasons why I think it is much better to have all the discussion and debate in an open forum. (as much as possible anyway) I ll try t give all the reasons later. Now we plan to transform something into English for that aw players who use English. If finishing, we will write to you soon. yeah a Chinese AW forum with many AWBWers exists, actually i'm a moderator of it. nano.RIPE fan is my currently active user name on AWBW. but we can't alter that forum much because it is run by Baidu, a company like google, we don't acutally own it. it might be complicated for non-Chinese users. My email address is chenhan1990520@hotmail.com. I'm glad to be in touch with every here. We are also fond of any information about AWBW. But Chinese network bans twitter & facebook, we have limited ways to find and reach amarriner. We need a bridge between this forum and the chinese one, if there is important news on either end to send across. We should plan for what is difficult while it is still easy. 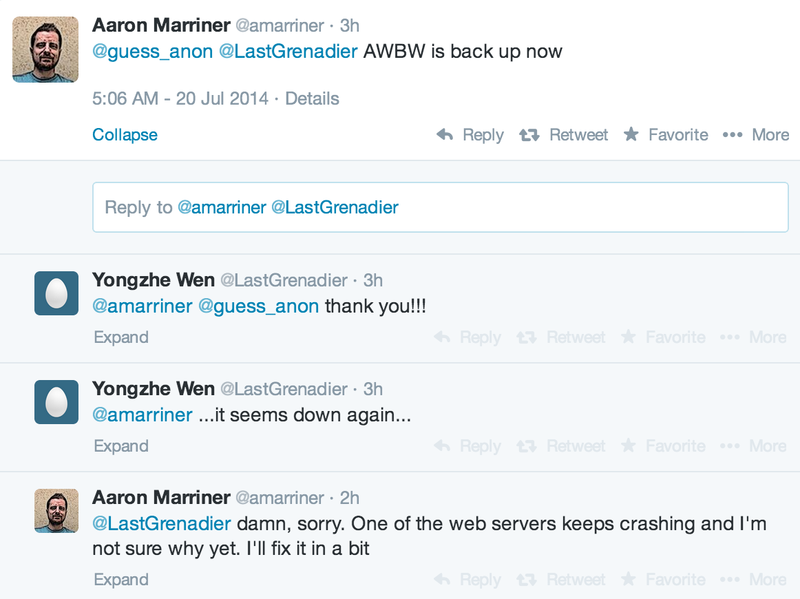 It's already a bit late in the game to try to fix things, but awbw is not down permanently yet so there's still hope. Blanci, I am willing to volunteer to set up a twitter acc to contact amarriner, but we should discuss between us to come up with a plan that we can put forward, or things we should discuss with him before we do so. Drawback is I am not familiar with how to run a site, who is willing to volunteer to do what, whether financial contributions are needed but one of us should definitely have a chat to aaron marriner to see what the problems / issues are from his point of view and share it with the rest of the community. Yeah, we clearly need some form of a link to amarriner, it's just difficult to establish that it seems. Sorry for being so busy recently, helping a relative with some medical issues and getting my car fixed right now. Get on steam - he sits around playing games all day on there. Divva wrote: yeah a Chinese AW forum with many AWBWers exists, actually i'm a moderator of it. nano.RIPE fan is my currently active user name on AWBW. It probably goes without saying but it seems AWBW has been down for a couple of days now. Does anyone know when it might be back up? Asked him about an hour ago, and he responded with this. I'd expect it to be back up in a couple more hours. yeah, that's a nice game. Hope the site back early, we can play again. Thanks for that Iordor. Let's hope for the best. In the mean time I found this game: http://www.silverwaregames.com/strategery2012/ it's AW redone around the 2012 primary election in the US. hey everyone, the site's back again. Thanks Iordor for all the info. You are a star. But please everyone with twitter let Marriner know theres plenty of players with high motivation to continue AWBW including many chinese with their own forum dedicated to awbw. And also theres a bunch of us willing to pay server costs and whatever else and do whatever else. If we need programmers we can get them. Blanci wrote: Thanks Iordor for all the info. You are a star. NP, I try to be constructive, and help out the community. I was a little repulsed by the idea of twitter myself, and thought it was for attention whores/thoughtless people who couldn't write more than a sentence, but after being on it for about a week I can tell you it's about the best online tool for networking, spreading/filtering/processing large amounts of information, and getting things done online - I now know why all those revolutions happened on the site, and recommend everyone to get one. I will link him to your post if you want, but he's probably going to need more information like who these people are, how to contact them, and the websites. Personally, I think a kickstarter would be cool, and he could even put awards to make it more worth while to help him get better servers, and upgrade the game - I'm sure there's some persian prince around here who could throw money his way. at Iordor... which "revolutions" ? do you mean setting up the global league? or the ladder? is your second comment to me? No, that was the old meebo chat with me, sulla, zovea, and ECK! But, yeah I'll tweet him your post.